Greetings again from the darkness. A nice story set-up is always welcome, and this one delivers a creative attention-grabber that draws us in pretty quickly. Brothers and long-time filmmaking collaborators Jean-Pierre Dardenne and Luc Dardenne (TWO DAYS, ONE NIGHT, THE KID WITH A BIKE) edited the film a bit after its Cannes screening, and the result is a quiet little whodunit with an interesting lead actress performance. A doctor and her intern have a disagreement at closing time, and opt not to answer the clinic door when a young lady rings after hours. The doctor’s guilty conscience leads her to become obsessed with finding out the name of the lady when she turns up murdered the next morning. It’s passionate and amateur sleuthing at its most awkward, unconventional, and dangerous. Dr Jenny Davin has recently accepted a post at the prestigious Kennedy Hospital, replacing a retiring doctor. The tragedy causes a change of mind on the job so that she may focus on the case and on continuing patient care through her clinic. The filmmakers initially wanted Marion Cotillard for the role (what filmmaker wouldn’t? 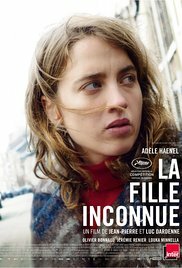 ), but Adele Haenel (LOVE AT FIRST FIGHT) brings her own approach, and though she doesn’t come across as the warmest person, it’s quite apparent that she is a dedicated doctor who cares very much for her patients. Even when she tells her intern Julien (Olivier Bonnaud) that “a good doctor must control his emotions”, she is ever-stoic with her delivery. The story is missing the usual Dardenne brothers’ twist, and instead, at its core is an ill-advised detective story and a case of morality, guilt, and the drive to do the right thing. The house calls and open communication with doctors will confound some U.S. viewers, but the various vignettes during Dr. Davin’s gumshoe work keep us engaged. The sub-plot with Dr. Davin reigniting intern Julien’s passion for medicine also maintains the minimalist approach and restrained performances … all with a very grounded approach with mostly handheld cameras. This entry was posted on Sunday, September 10th, 2017 at 11:02 pm and is filed under Drama, World Cinema/Foreign. You can follow any responses to this entry through the RSS 2.0 feed. You can leave a response, or trackback from your own site.